Abstract: Information Systems instructors are generally encouraged to introduce team projects into their pedagogy, with a consequential issue of objectively evaluating the performance of each individual team member. The concept of "freeloading" is well-known for team projects, and for this, and other reasons, a peer review process of team members, by team members, is often advocated. We propose an objective heuristic model for obtaining a scale of individual performance, based upon a generalization of Thurstone's Law of Comparative Judgment, where pair wise comparisons of team member’s performance are elicited with regard to various criteria, and we demonstrate how a scale may be obtained to objectively rate the individual members of each team. 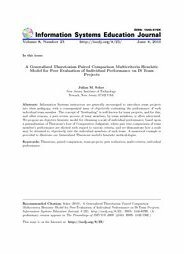 A numerical example is provided to illustrate our Generalized Thurstone model’s heuristic methodologies.